This Recipe is from Various sources on internet. You can know more about my adventure with it here. 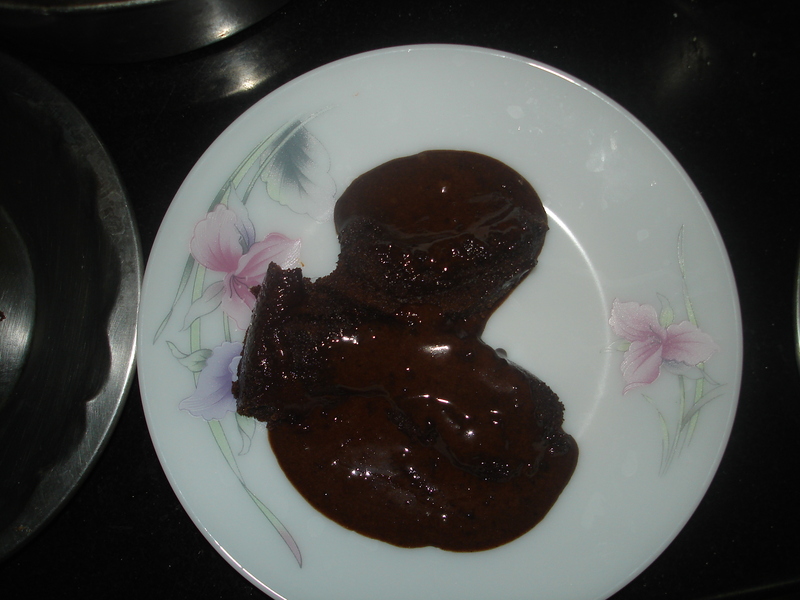 1) Make the batter of normal chocolate cake. 2) Keep it a little liquidy by adding a little extra milk (and sugar for that milk). Mix well. 3) Pre-heat the oven to 180 degree C.
4) Now grease ramekins, or use butter paper cups. 5) Pour the batter in the ramekins/cups. 6) Based on the size of your ramekins/cups you will have to set the timer for baking. For the medium sized butter paper cup, bake it for 6 minutes. For a bigger ramekins you may need baking upto 10 mins. 7) Once cooked, run a knife on the sides and take the cake out carefully in the serving plate without breaking it. If using the butter paper cup then no need to take out the cake, serve as it is. By the way, i used normal steel katoris (of medium size) for baking this cake as i didn’t have ramekins. For this, i kept timer on 5 mins. But keep in mind that based on the size of your baking bowl/ cup/ ramekin the size may differ. Please perform the test mentioned below before cooking the cake further or taking it out. Here, you have to be very cautious because extra cooking may mean that there won’t be liquid in the center. There is a test to check the state. See that the top is cooked and is a springy, when you put the knife inside, it should be coated with the chocolaty liquid. So basic idea is to cook sides, top and bottom and let the center be liquidy. Previous Post: Ice-Cream cake or Cake Ice-cream?!?! 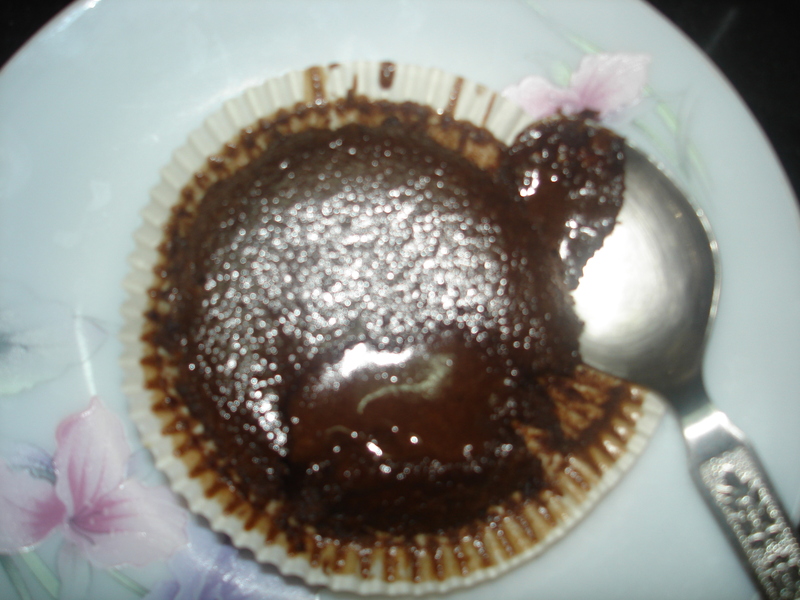 yummy and perfect..i love lava cake…. Wow,that looks perfect and super delicious! !